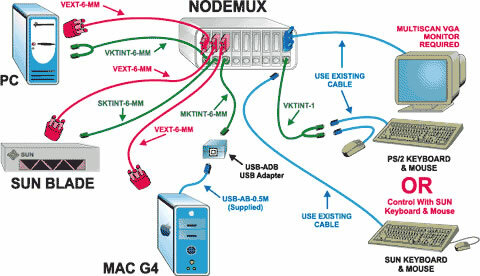 The NODEMUX� SUN PC Single-User Multi-platform KVM switch allows one keyboard, monitor and mouse to control up to 16 computers. Dedicated internal microprocessors emulate keyboard and mouse presence to each attached computer 100% of the time so all computers boot error-free. Dimensions: 11.5" x 7.8" x 6.1"